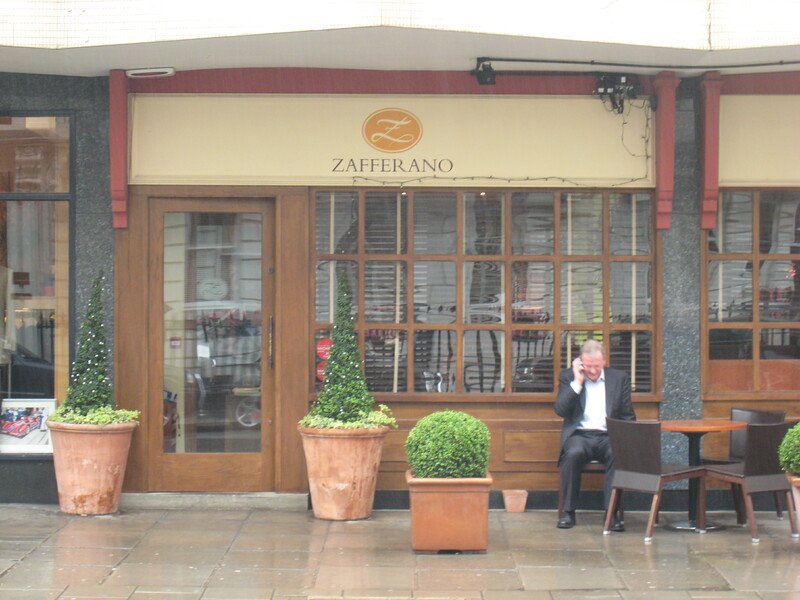 Zafferano first opened at its Belgravia home in 1995 and soon enough, Head Chef Giorgio Locatelli established it as one of the capital’s finest dining spots, earning critical success and awards, including a magical Michelin star, along the way. 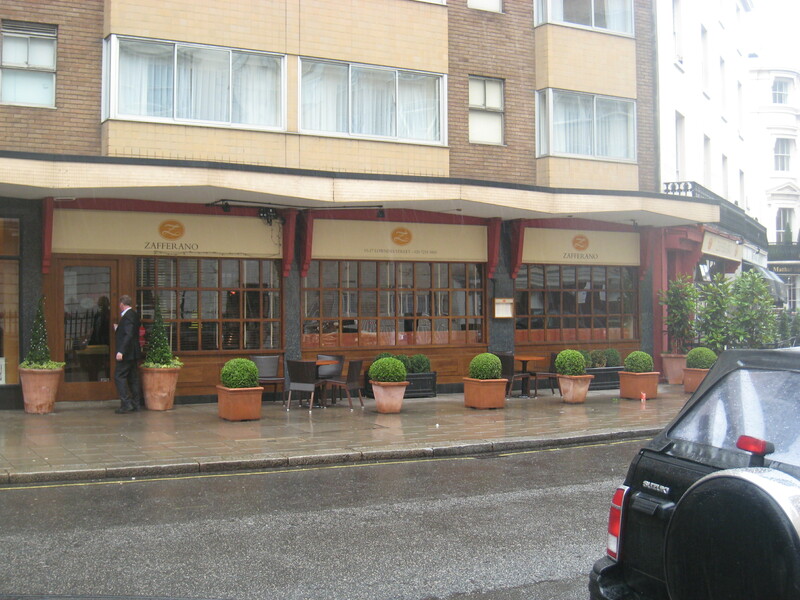 In 1999 however, Giorgio left, eventually settling in at the Churchill Intercontinental in Marble Arch with his independent and eponymous Locanda Locatelli. Here he recreated the success he first achieved at Zafferano, earning himself another star. So what of Zafferano? Like a ship without a rudder, a restaurant without its iconic head chef, is bound to flounder, is it not? Not at all. After Giorgio’s departure, his former number two, Andrew Needham, took the reins and not a beat was missed. Andy quickly steadied the ship, not only saving Zafferano’s star and stewarding a successful era of expansion, but also building a name for himself as an authority on cucina nuova. Andy, who started his career aged seventeen at the Savoy prior to working at Paris’ Le Pre Catalan (3* Michelin), then Giorgio’s uncle’s La Cinzianella in Northern Italy and finally Zafferano as Giorgio’s sous chef, has a style that is more conservative than creative; his dishes are straightforward and traditional, but with occasional subtle, modern twists. The focal point of Andy’s approach is his uncompromising attitude towards raw materials: he regularly tours London’s specialist markets – Borough, Billingsgate, New Covent Garden and Notting Hill Farmers’ – himself, as well as having personal contacts abroad armed with digital cameras who email him photographs of the produce in the markets of Paris, Milan, Bologna or elsewhere, thus allowing him to personally pick only the freshest, finest supplies. The rather reasonably priced menu (note bene: watch out for all the supplements) is the embodiment of these principles; the kitchen, drawing on classic, honest Italian cooking methods, creates simple dishes crafted to showcase these superior ingredients. There is indeed a dynamic choice offered with dishes regularly changing every few weeks as food comes in and out of season, whilst specials are dictated by the market so can vary from day to day. The restaurant itself differs from most other top end eateries, being casual and comfortable rather than slick or flashy; its solid wooden frontage with its lush shrubbery is discrete enough that one can walk past without noticing it. Exposed brickwork, soft furnishings, ceramic tiled floors and a plethora of fresh flowers engender a real rustic charm inside that is welcoming, full of character and still classy. The dining area is tranquil and serene, soothed with earthy, warm hues – scarlet and ochre upholstery, peach cream walls and terracotta tiles – and soft lightning and, though tables are surprisingly small and intimately set out, the room remains open and spacious. The atmosphere is at once buoyant, relaxing and utterly unpretentious. In contrast to his convivial surroundings, my waiter, Constantino, at first came across distant, a little cold and possibly irritated with me and the time/questions it took me to order. However, I am glad to say this did not last and soon, the ice began to thaw; maybe realising how interested I was in the food, cooking and restaurant, he started to open up, becoming very friendly and talkative. In fact, he proved impressively well informed and we established a genuine rapport as he regaled me with many interesting anecdotes and trivia about the various dishes’ recipes and histories. Before the food was served I was also shown around the kitchen by sous chef Justin, who was kind enough to explain to me how everything worked. It was surprisingly small given how much is done within: chefs butcher the meat themselves, 30kg of seafood are delivered each day, bread is baked fresh and eight types of pasta are made daily as are homemade ice creams and sorbets. The Zafferano delicatessen next door is also catered for, which explains the frequent sight of waiters leaving the restaurant with large trays of focaccia. 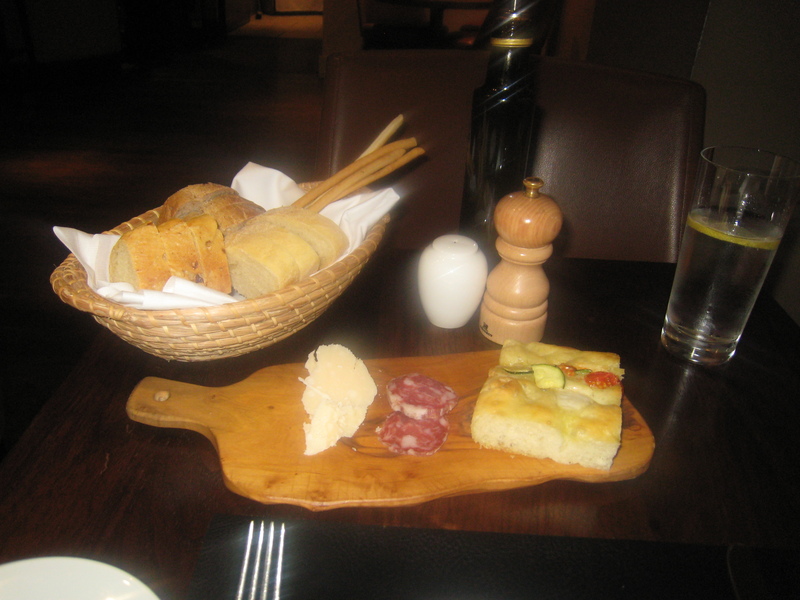 Stuzzichino: Parmegiani, salami e focaccia (from left to right above). 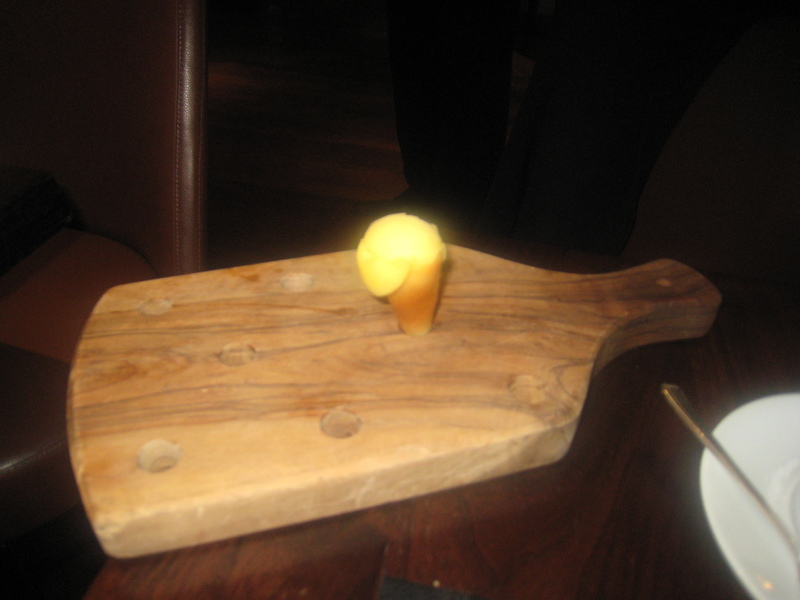 A pastoral palate-platter was presented to fuel my perusal of the menu. The rustic rhythm was repeated with rough hand-broken bricks of fresh, nutty parmesan, thick carvings of Italian salami and a soft, fluffy focaccia topped with cucumber and cherry tomato. The cheese was good, the focaccia decent, but a bit heavy on the olive oil and, as I do not eat pork, I had to snub the salami. Il Pane: Grissini, flavoured white (mushroom or tomato) and brown bread. Last week the bread at LL was so good, it might just have ruined me for other bakers and, inevitably and unfortunately, the granaio (breadbasket above) here was well-licked by LL on both quality and quantity. Grissini had a slightly chalky consistency and a lack of length that was somewhat embarrassing when measured against LL’s impressively long specimens – alright, alright…the LL comparisons shall cease here (FYI that was probably a lie). There was a plain brown too and also white bread with a sporadic filling of mushroom or tomato that when finally found was moist and tasty; both varieties, generally soft and light, but with a chewy crust, did improve as lunch progressed. Very light extra virgin olive oil accompanied the selection. Antipasto 1: Carpaccio di manzo con parmigiano e balsamico. 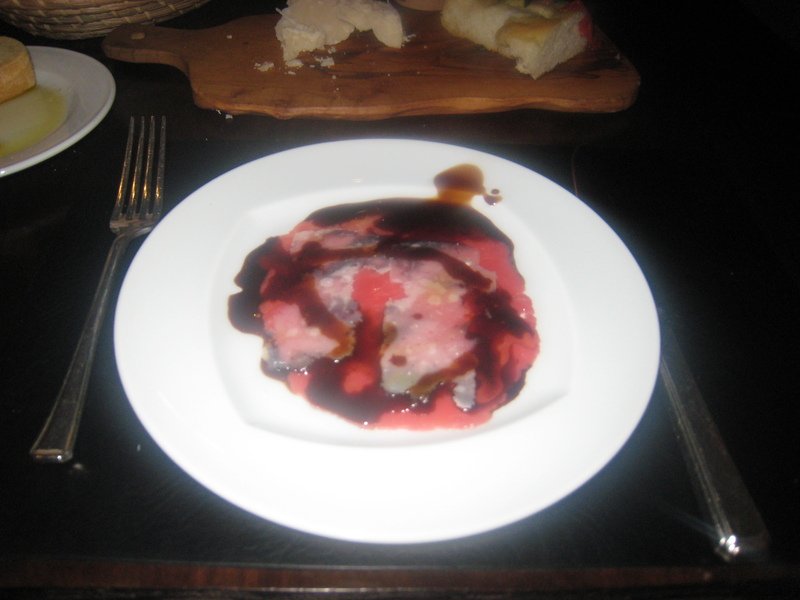 Served first was thinly sliced beef carpaccio with parmesan and balsamic vinaigrette; a gift from the kitchen. The delicate slithers of beef were surprisingly tender and when melded with the rich parmesan, each mouthful melted into a creamy mush. The 25 year old balsamic vinegar (older than me! ), poured from a small vile carried by Constantino like some secret potion, gave the dish a sweet acidic buzz. This starter set out the stall for what to expect at Zafferano: simple dishes that allow superb ingredients to do the talking. Antipasto 2: Insalata di scampi con zucchini e basilico. 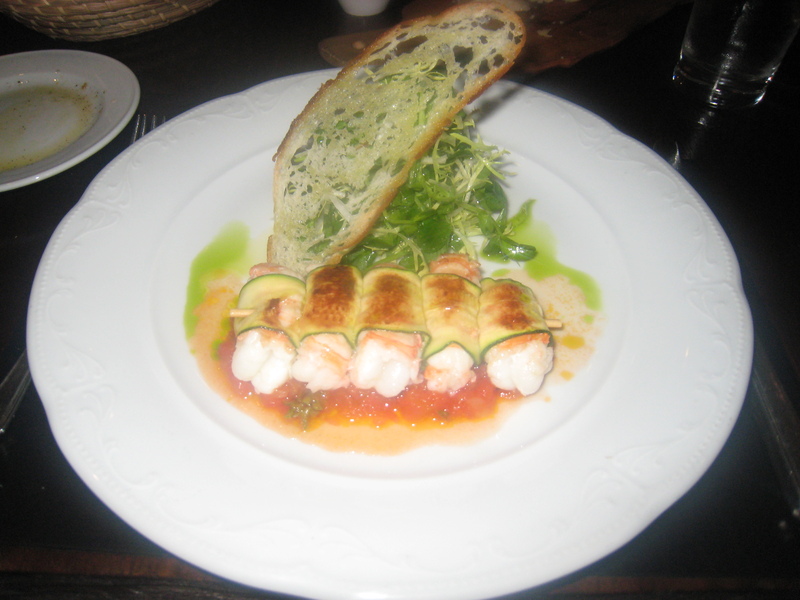 A langoustine salad with courgette and basil began the prearranged courses. It was picture-perfect: soft, subtle shades of pastel greens, reds and yellows blended together to create a warm, fuzzy watercolour. A juicy quintet of lovely plump langoustines, each wrapped in a char-grilled courgette blanket of golden brown and green trimming and all skewered together, swam in a shallow ichor of wonderful Italian tomato infused with basil. The dish was completed with a fresh leaf salad and perforated slice of ultra-thin bread grilled with olive oil. The strong, sea-sweet savours of the shellfish, which though firm, dissembled effortlessly in the mouth, were highlighted by the sweet and salty salad and complemented by the delicate courgette. The crunchy toast and crispy roots contrasted well with the succulent scampi and zucchini. There was a somewhat sour aftertaste however from the £15 supplement attached, which single-handedly obliterated the saving from the lunch/dinner differential. Primo Piatto 1: Linguine con aragosta. 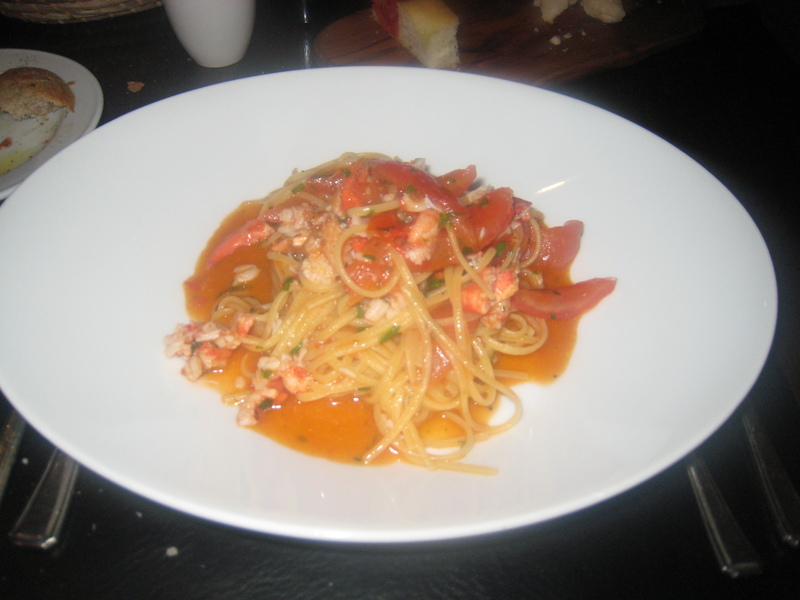 Linguine with lobster and tomato was next. Lovely lissom lobster bites, nestled amongst golden chords of al dente pasta, were bathed in a persimmon-coloured tomato sauce that, suffused with chilli, imparted gentle warmth to the whole dish. 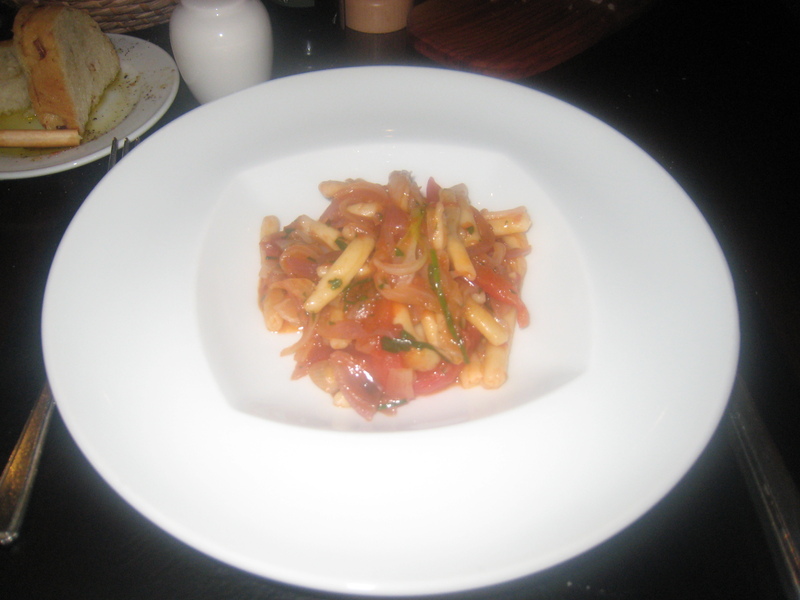 So far, this was pretty much a carbon-copy – even down to the decorative specks of parsley garnish – of the linguine all’astice at LL – I knew I was lying earlier when I said I would not mention LL again, but, having ordered the same dish at both restaurants, some sort of contrast is just unavoidable. The USP of Zafferano’s version however, is the addition of thick fillets of steak-like tomato; these were luscious and mushy and added depth to the seafood pasta. This traditional dish was wholesome and satisfying …(and better than LL’s!). Pesce: Salmone con spinaci e balsamico. 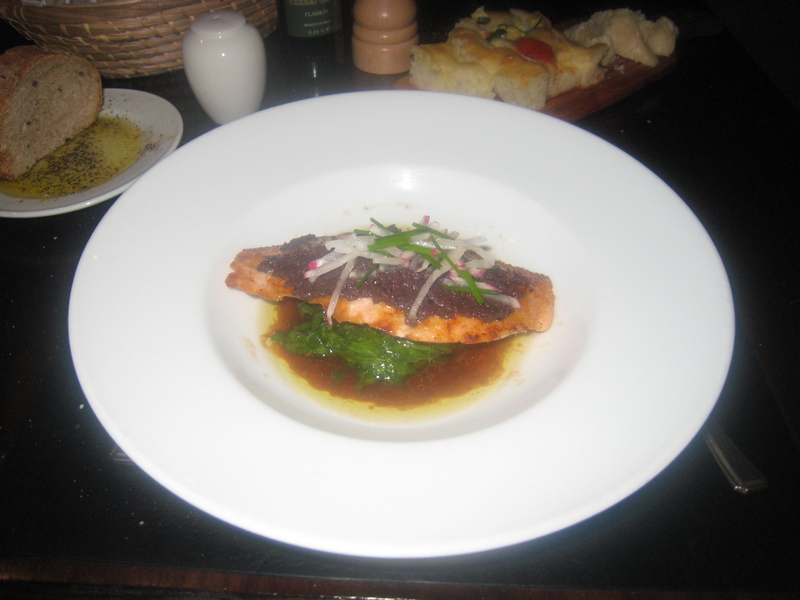 A fish course of pan-fried organic salmon with spinach and balsamic vinaigrette followed. A fillet of rusty-pink salmon, on a bed of deep green spinach which lay in a shallow olive oil and vinegar lake, was dressed in a black olive tapenade overcoat and adorned with translucent snips of radish. Not normally do I order salmon, but I was in the mood for something different. I should have stayed with the familiar: the fish was cooked quite well with a crispy skin contrasting against soft, flaky flesh but, though the best time of year for salmon-eating, the fish was dull and lacked that oily omega-3 richness one expects from this fish. The spinach, rather lifeless and drowning in an acid bath, was maybe overdone. The tapenade had good flavour, but was not always detectable. The various, strong flavours – salty salmon, bitter olive, sour vinegar – had to fight it out for the limelight; I felt sorry for the sorry spinach. I did like the intense olive oil-vinegar combination though; it reminded me of when, as a child, I would be given hot, oven-fresh bread and the same mixture to dip it into. At this stage, I was just starting to sense those sensations of satiety that serve as sensible stop signs for sensible people, so I was glad desserts were due; it was going to be a sweet change not to have to eat through the fullness barrier this time. But it was not meant to be: lo and behold, out came Constantino with another bowl of pasta! ‘You must-a try this, its just-a small portion’, insisted he and with his eyes all lit up and a smile perched on his lips, could I, would I, did I refuse this man? Primo Piatto 2: Strozzapretti con cipolle di Tropea. Obviously not. He had brought me a plate of steaming strozzapretti, twisty twirls of tubular pasta, perfectly prepared and paired simply with fresh tomatoes and onions. However, these were no ordinary tomatoes and onions, but the thick, meaty aforesaid juicy Italian tomatoes and sweet, red Calabrian Tropea onions, with which I had only recently found and fallen in love with. Together, they formed a moist, mushy webbing for the wholesome carby curls of pasta that, surprisingly soft and creamy in consistency, with each mouthful melted away to leave just the subtle crunch of the tropeas. This classic example of hearty Italian comfort food was delizioso. Grazie mille, Constantino. Dolce 1: Tiramisù. 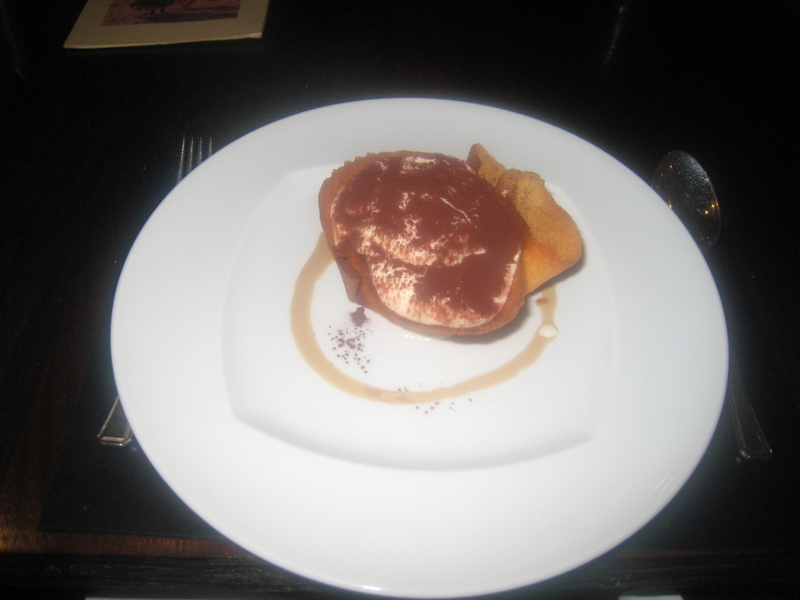 Zafferano’s legendary rendering of the most Italian of dolci did not disappoint; finally an indulgent, decadent dessert! The smoothest, freshest, thick mousse came cocoa-covered and shelled in a light, delicate tuile basket. My taste buds, slapped awake by bitter cocoa, were then immediately soothed by the sweet whipped mascarpone, whose richness was in turn gently cut through by the soft Marsala-soaked sponge. The last lingering taste was of the confectionary casing whose sugary crunch contrasted superbly with its creamy content. Each deep spoonful of this oozing, messy marvel was cherished. Wow. Dolce 2: Pannacotta alla vaniglia con fragole e basilico. 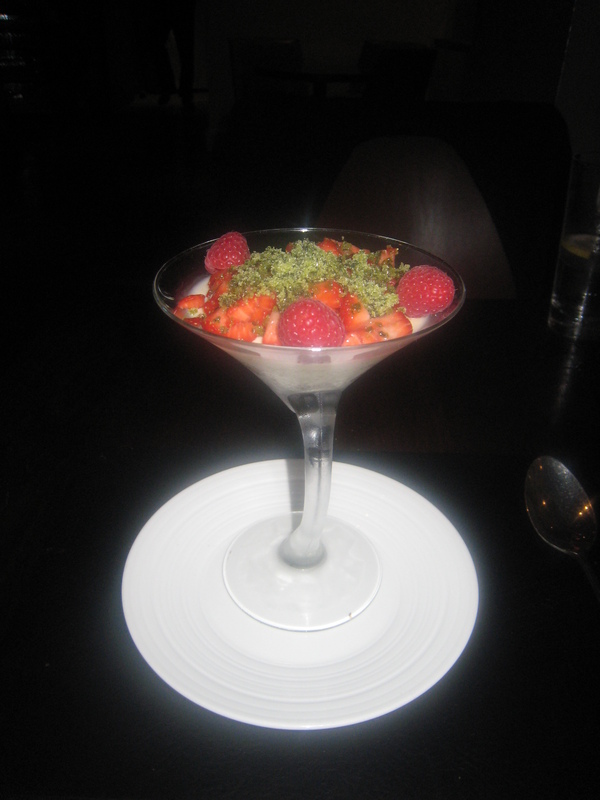 Next up was a vanilla pannacotta with strawberry and basil sugar served in a coupe. Refreshingly cool, smooth and silken, this is ideal for summer. The ‘cooked cream’ was richly flavoured with actual vanilla seeds instead of essence, discernable later by their clustering at the glass’ base. Diced strawberries allied with whole raspberries, both very much in season, provided a touch of acidity to counterpoint the fruity sweetness and creaminess of the mousse and sugariness of the even sweeter basil. The precious garnish of crystallised herb névé, whose sparkle had misled me into mistaking it for gratings of green emerald, was most memorable. With its strong, garden aroma, deliciously sweet, earthy tones and sandy-fine texture, it was a surprising, but effective twist on an age-old recipe. After the pannacotta’s consumption, the bucolic basil lingered on both my breath and between my teeth, pleasantly effervescing. Dolce 3: Mousse di cioccolata con frutti di bosco e gelato di pistacchio. 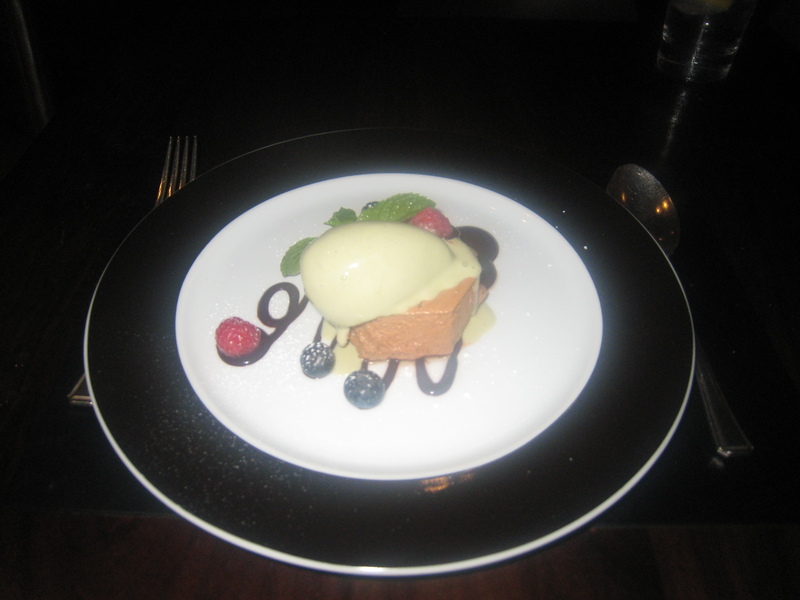 Lastly a chocolate mousse with summer berries and pistachio ice cream was brought out. The thick, milky mousse concealed a dense, crunchy caramel toffee biscuit base; a customary textural play on the classic combination of cream and crunch. Homemade ice cream, which really tasted like what it was meant to (pistachio being a difficult flavour to instil) and topped the hexagonal chocolate treat, was served at melting point, on purpose I assume; the melted ice cream i.e. cream that flowed off the mousse, flowed onto the plate and mixed with waves of rich dark chocolate sauce that the dessert rested on. More seasonal fresh fruits – raspberries again, but blueberries too – dotted the plate like tiny islands in a sea of creamy chocolate. Well, it seems that Giorgio has trained Andy very well, maybe even a little too well! The food was direct with flavours fresh, clear and distinct and the cooking assured and authentic. Andy’s uncompromising attitude towards produce was evident today: from the abundance of seasonal foods – salmon, courgettes, strawberries, raspberries – to the sourcing of local, traditional ingredients – fresh Italian tomatoes, Tropea onions. The focus on these raw materials, much highlighted by the chef himself, distracts the spotlight from his own culinary skills and expertise. It takes precision, good judgment and an innate insight into Italian culinary ideals to produce such simple, balanced and delicious dishes as Zafferano does daily. Actually, it is hard to believe Andy Needham is not himself Italian; although explicitly English, a Yorkshire man no less, I am convinced that water from the Tiber or maybe Arno runs through those veins. Service is friendly yet formal, refined without being cold. I felt very well looked after by my principal waiter, but besides with him, there was little active interaction with any of the other staff; they kept a respectable distance, carrying out their duties efficiently, well and with smiles on their faces, but without establishing any real personal connection. The obvious way to conclude this critique would be to judge whether Locanda Locatelli or Zafferano is the better restaurant. But, at the risk of disappointing everyone, I really do not want (cannot) do that. I will state the obvious though, that each has its strengths, such as LL’s bread and Zafferano’s desserts, and I would definitely return to both. In conclusion, I was delighted that my recent run of very enjoyable dining experiences continued at Zafferano. My meal here left me deeply satisfied and very content, which is just how I want to feel after eating Italian food.